PESHAWAR - On the special instructions of Chief Minister Khyber Pakhtunkhwa Pervez Khattak, it has been decided to immediately open the under construction Lawari Tunnel for passengers. 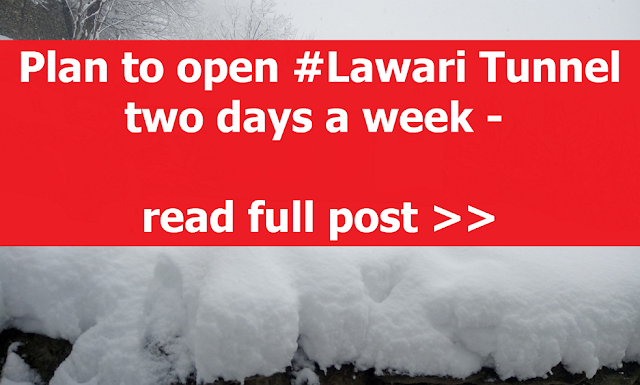 Keeping in view the difficulties of Chitral’s passengers because of the closure of Lawari top due to snowfall in winter season, the under construction tunnel will now be opened for two days in a week viz Saturday and Sunday. In this regard, the concerned divisional and district administrations, National High-Way Authority and Pak-Army have been assigned the tasks of security of passengers and other necessary arrangements. The NHA will halt the construction work inside the tunnel on Saturdays and Sundays and clear it for traffic by pulling out heavy machinery of the tunnel for which the provincial government will pay Rs3,00,000 per day to the concerned company as compensation of its loss thus incurred. Security and other arrangement for passengers will be made in the joint supervision of commissioner Malakand, DIG Police Malakand and 17 Infantry Division of the Pak-Army while the district administration of Chitral and Upper Dir have been assigned the task of health care and food for the passengers. Medical camps will be set up on both ends of the tunnel to provide first aid and emergency treatment facilities to the passengers. While women, children, aged and ailing ones will be taken special care of. The passengers will be made bound to carry dry fruits, water, oxygen masks and torch lights with them to avoid any untoward situation inside the tunnel incase of passengers vehicles brakes down, traffic jam or other emergency. They will not be allowed to carry gasoline or other combustible materials with them. They have been requested to cooperate with the administration in this regard. It is worth mentioning here that on the special directives of chief minister Pervez Khattak a meeting of the divisional and district administrations, police and the 11 corpe of Pak Army chaired by chief secretary Khyber Pakthtunkhwa, Arbab Mohammad Shehzad was held to review arrangements for opening the tunnel for traffic. However, the issue was then resolved on crash contacts of the chief minister with concerned authorities following a meeting of the Chitral MPA Fouzia Bibi and PTI District V.P Razeet Billah with him at CM Sectt Peshawar and complaining about this important human issue.